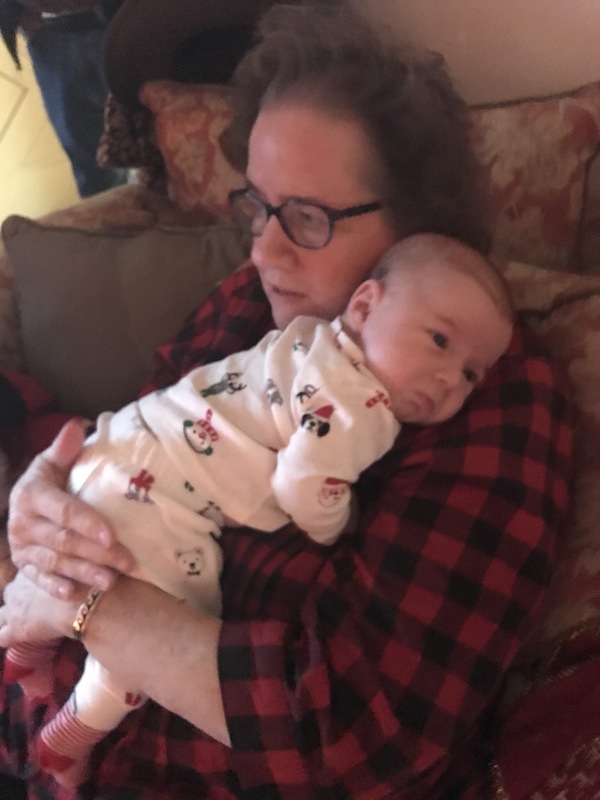 I couldn’t wait to celebrate the Christmas season with William. 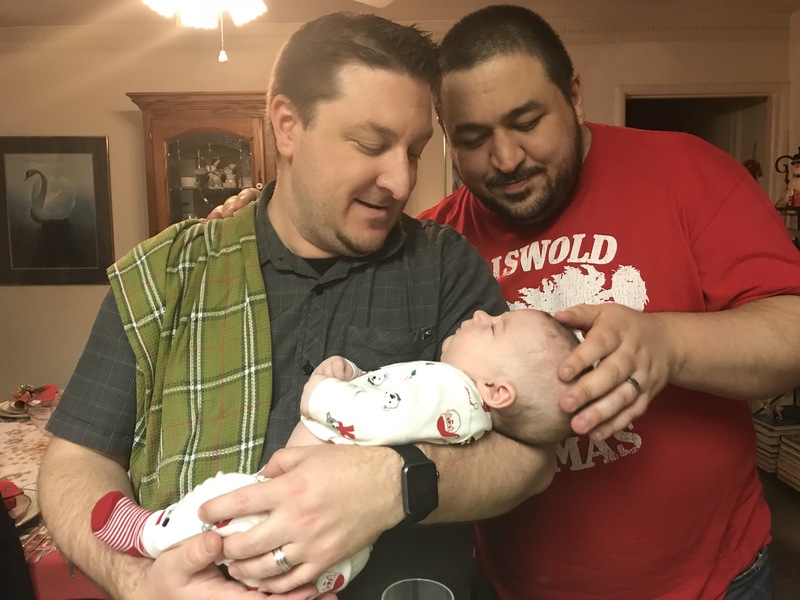 From Christmas attire to presents to stockings, there was so many new experiences to have with our infant son. He had already outgrown his Santa outfit, however, he did fit into his Christmas pajamas well. 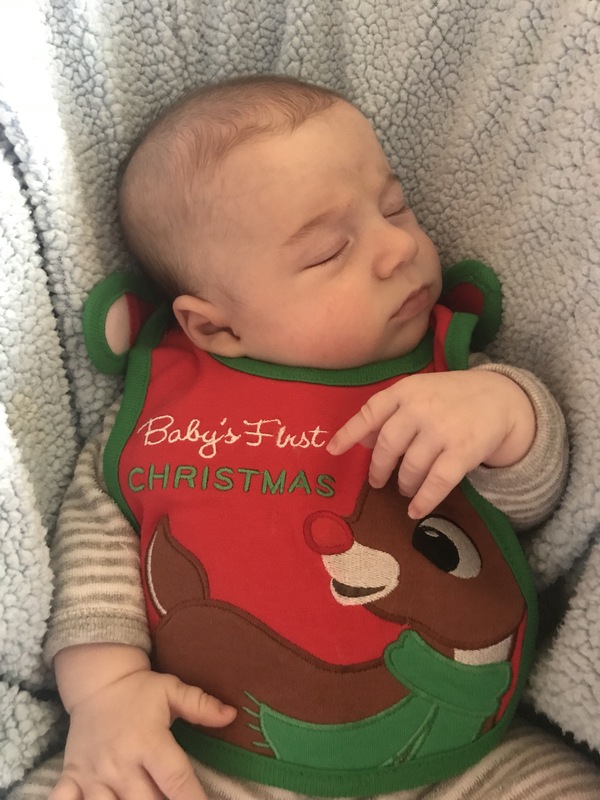 Though his Santa suit was too small for him, and the two My First Christmas outfits we bought were too big, the bib fit him just right. 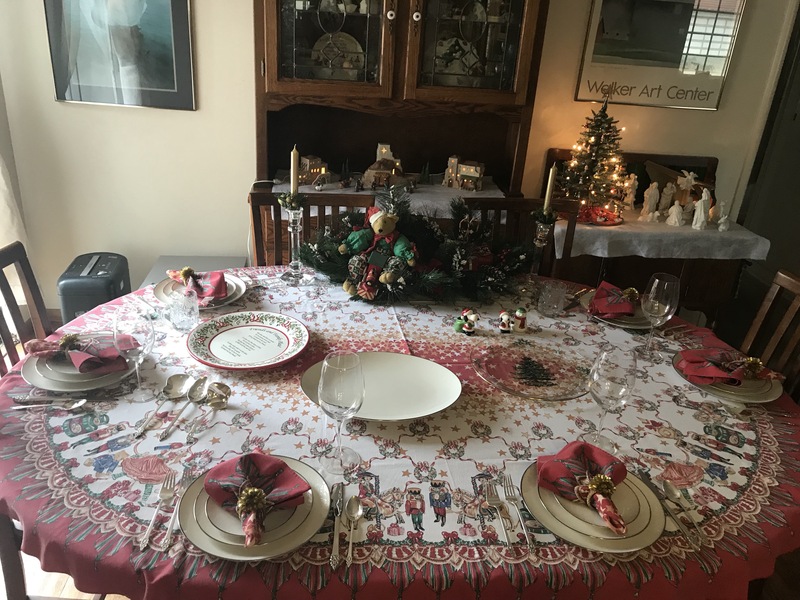 As always Candy had her dining room decorated with many trimmings of the season. 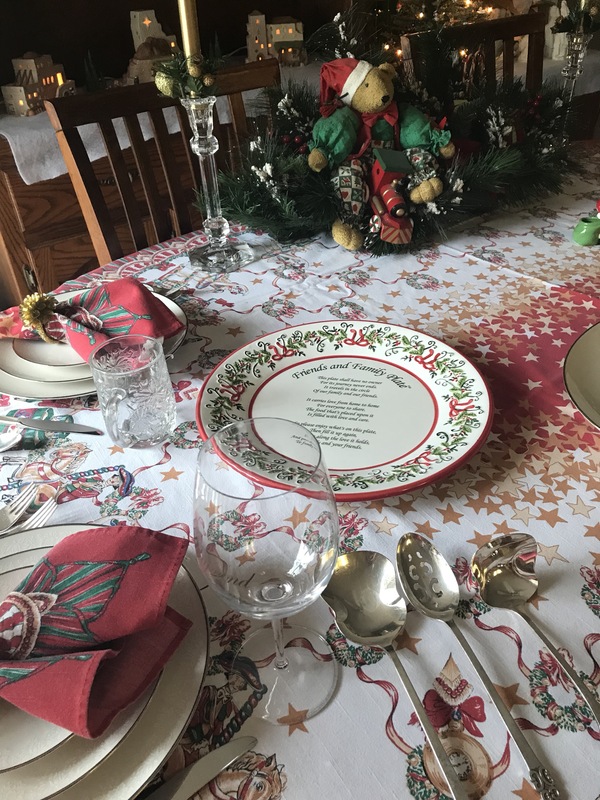 This plate is supposed to be passed back and forth between family members with a sweet treat such as cookies and fudge placed on top. The living room was full of presents and stockings. William’s stocking coincidentally was the biggest of them all. Clearly, I was one of many people who looked forward to seeing this season through William’s eyes. John and Jennifer came over to visit first. 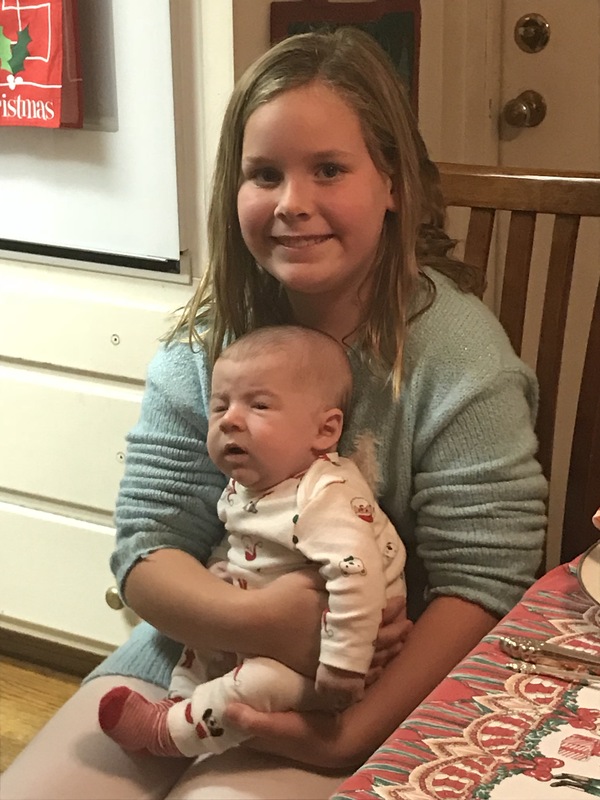 She wanted to hold William, who she said had definitely grown since Thanksgiving. 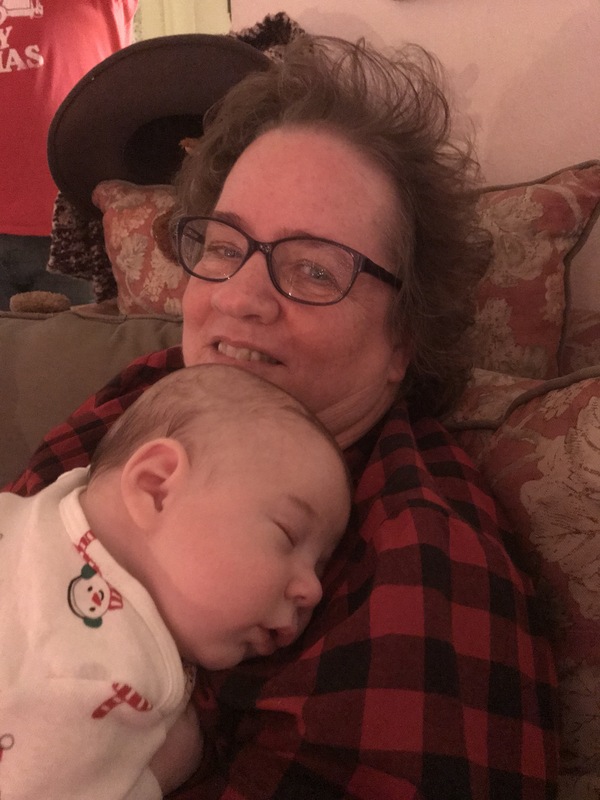 She, as an experienced mom, had him asleep against her shoulder in almost no time at all. 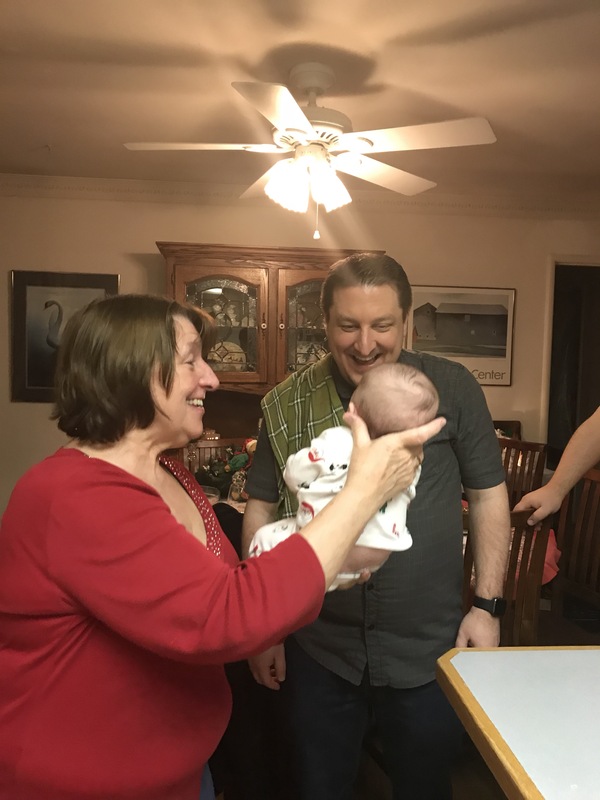 Scott came over to see William before his own family dinner. Everyone was all smiles looking at William. William fell asleep easily on Scott as well. I really see the family resemblance between Scott and Matt in this photo. 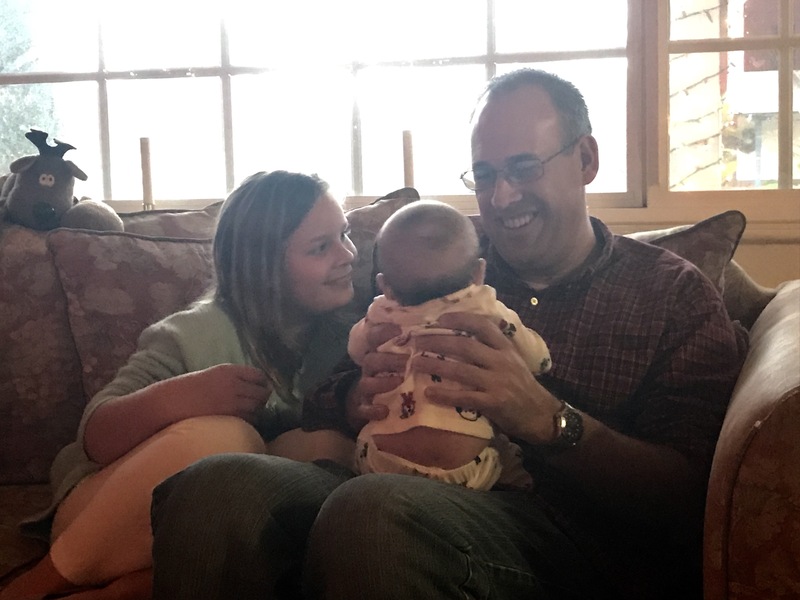 Steve and his daughters, Abby and Annie, also joined us for the evening and dinner. Annie had lots of questions for me about my pregnancy and William. Perhaps this is as there are so few baby boys born into her family. 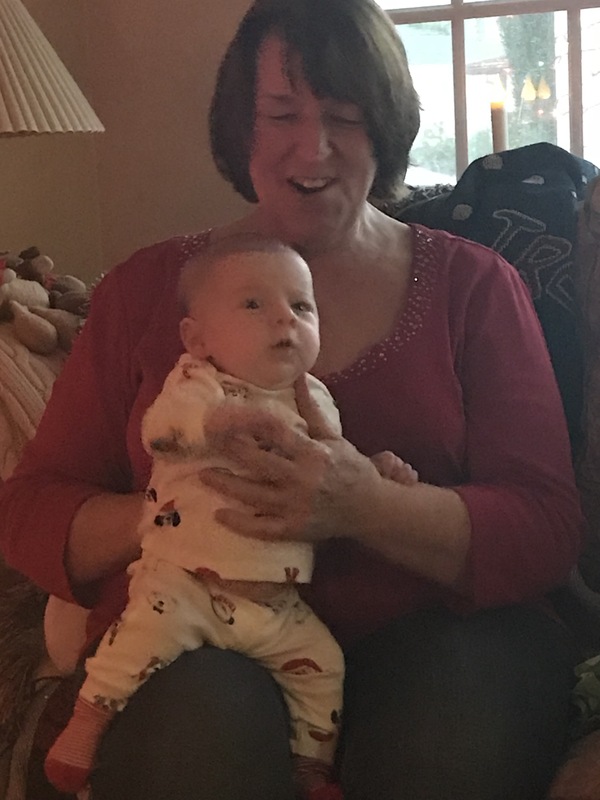 She enjoyed holding him as well. 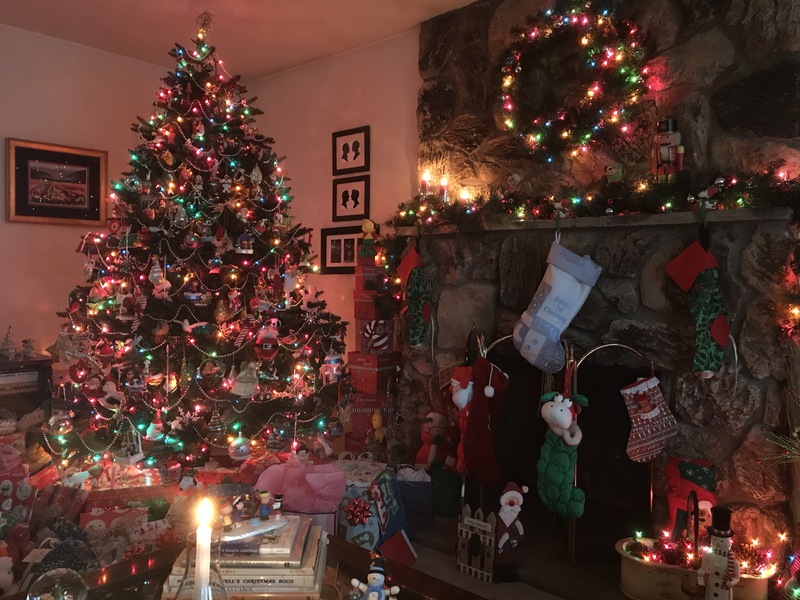 In the Pleasanton family tradition, Christmas gifts are opened on Christmas Eve and stockings are opened on Christmas Day. It was fun showing William his wrapped presents event though he would not appreciate the paper and ribbons. 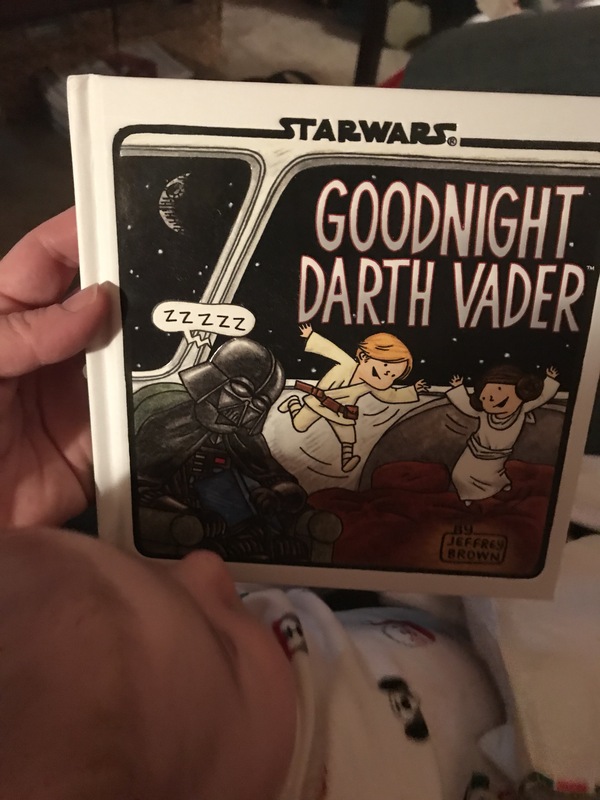 Scott and Jennie had given him Star Wars themed presents, among them was Good Night Darth Vader. 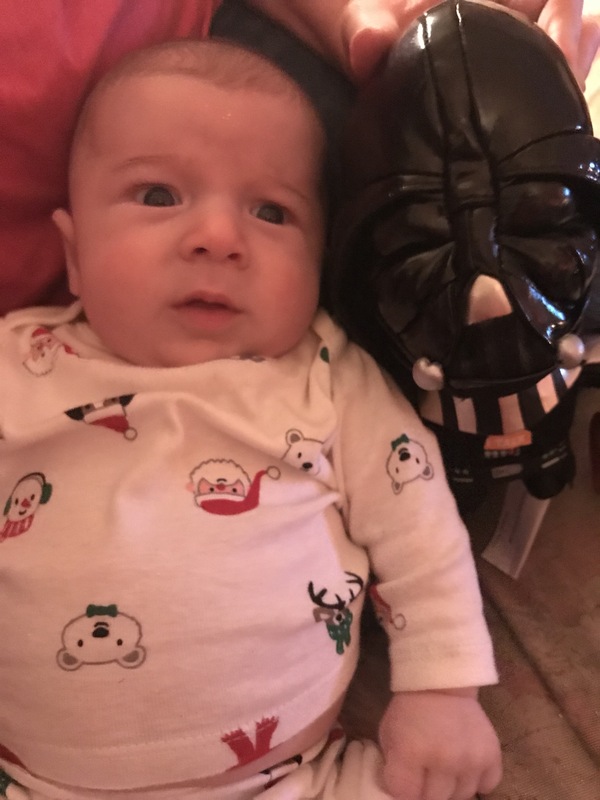 They also gave him a talking Darth Vader doll. I’m not sure what his expression here means. 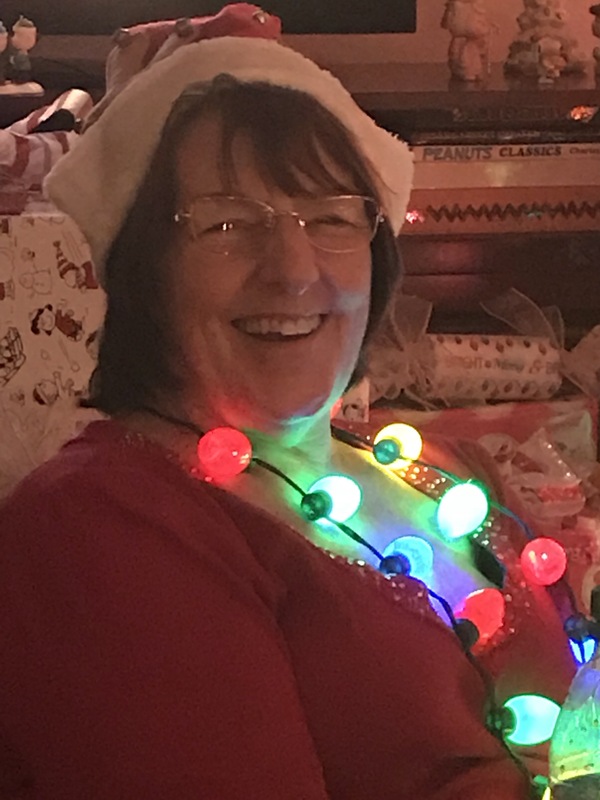 When we attended the Pleasanton Holiday Parade this year, Candy had said several times how much she liked the Christmas light necklaces that so many people wore. I found two of them, one longer and one shorter (the shorter one with fewer lights), so I bought her both. Here she is wearing the longer of the two. I love the look of happiness in her eyes. 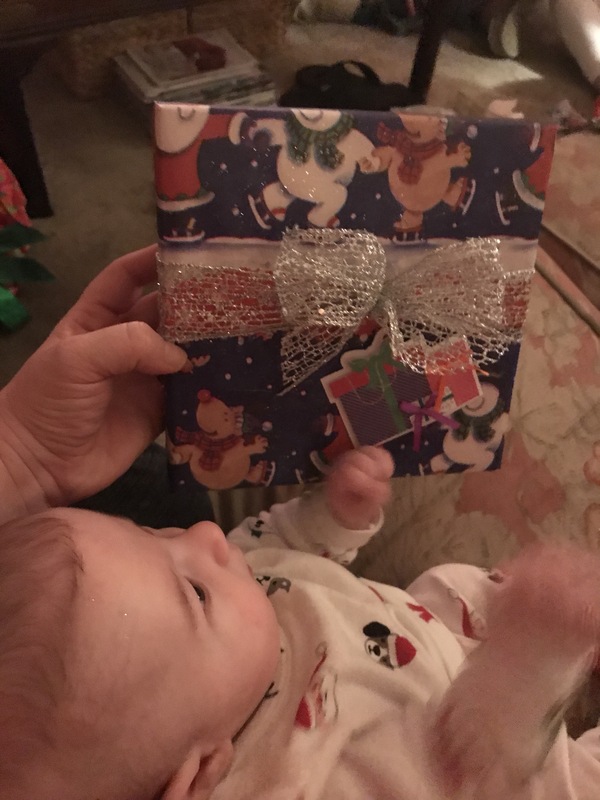 I couldn’t wait for Matt to unwrap something special. 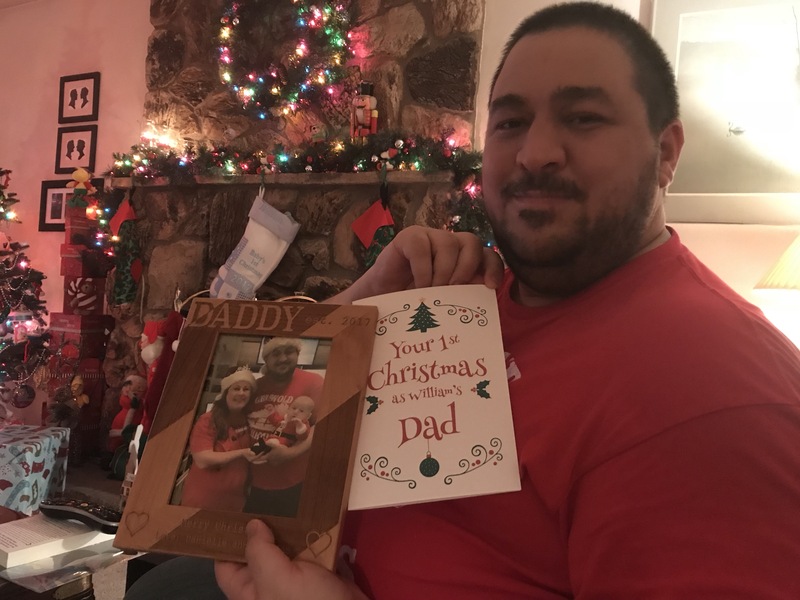 The card and frame were from William and I both to Matt on his first Christmas as William’s dad. 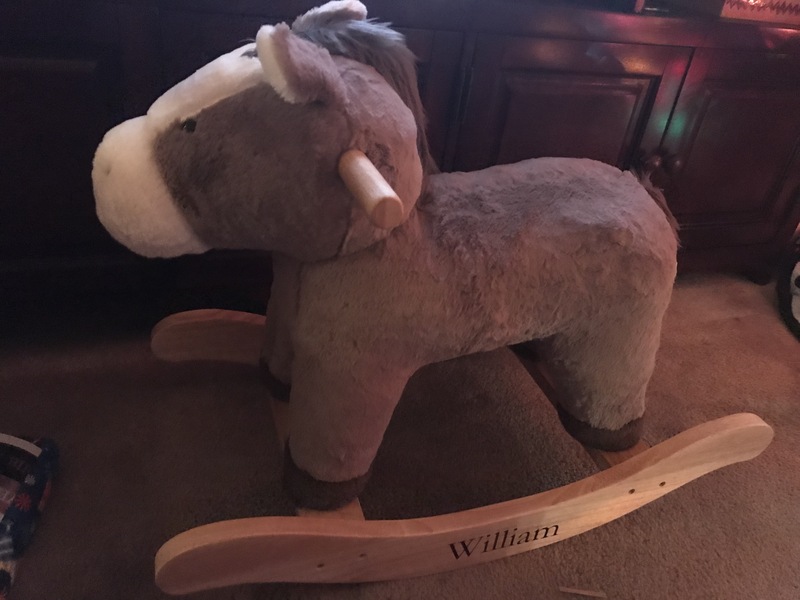 Candy bought William a gift she has always intended to buy her future grandchild(ren), a hobby horse, personalized with his name. 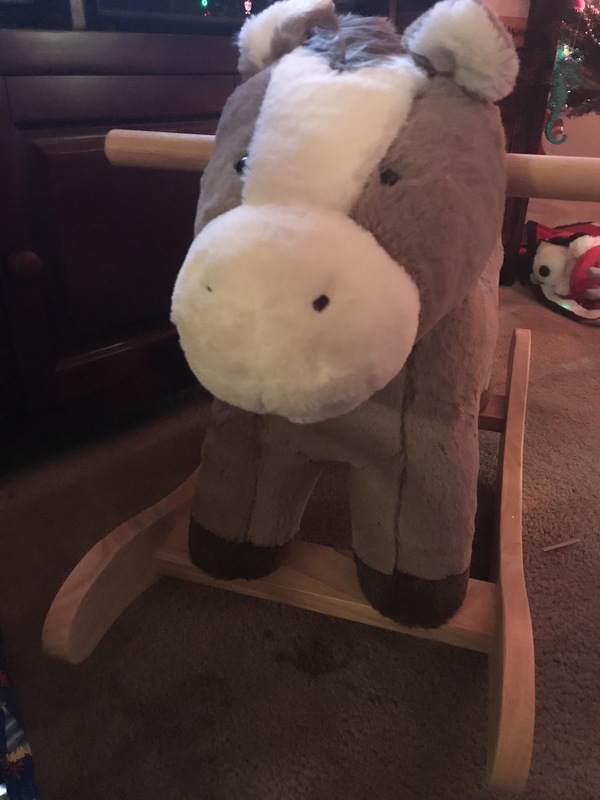 It will be something he can ride by himself on or around his first birthday. 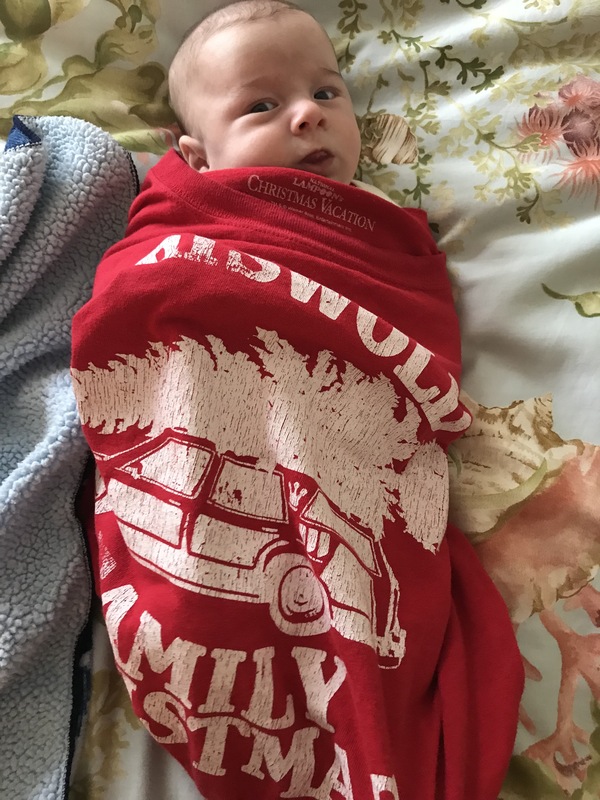 Matt is known in our house as the Swaddle King as he is the only one of the two of us who can make swaddles William does not break out of in a few minutes or less. 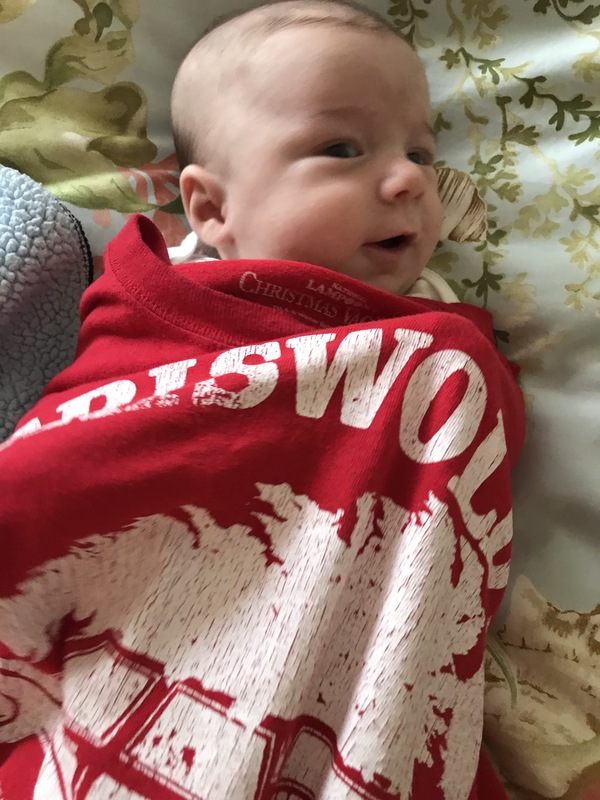 Matt made him one out of his favorite Christmas shirt to show how easy it was, and William obliged by not wriggling out of it, as he would have had I made it.